I want to merge the first and second (sda5 & sda2) partitions but GParted can't merge 2 partitions if the unallocated space is before the partition to merge with. Can I move sda5 with GParted? Does it have to be unallocated to move it? I have looked at GParted help but I'm a bit confused by it. Is there another program I could use that can merge with preceding partition? It would be helpful if you were to post a snapshot of gparted showing your sda drive, as I suspect that your description may not be complete. Just to confirm, what you want is to make your Windows partition larger, and that sda5 is empty and can be deleted to make it truly unallocated, yes? If yes, then it's possible to do what you want, but I'll caution you... BACKUP BACKUP BACKUP first. Moving data and partitions around can be risky, so be prepared. I'll also caution you that any time you mess with a Windows partition, it'll probably not boot into Windows the first time without some help. You'll want to have boot-repair, and a Windows install disk ready, just in case. Are you ready to do this, or is it too much, too scary? More detail available on request. Using GParted I removed the flag from sda5 as it couldn't be deleted with it, deleted sda5 and sda1 to make them unallocated. 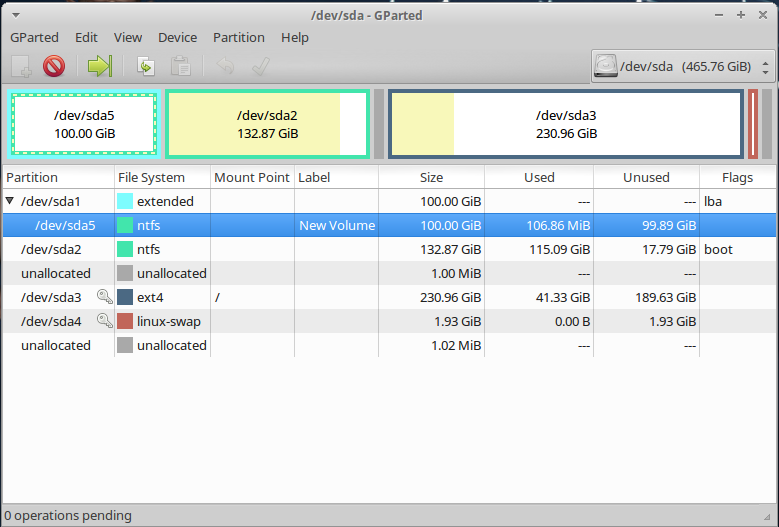 Then selected sda2, selected partition>resize/move then moved the slider all the way to the left, effectively merging the two partitions into one. I updated the grub manually. No need for Boot-Repair, no need to boot into Windows. So where ever it was I read GParted can't merge with a preceding partition was probably old because it can!. Not the answer you're looking for? Browse other questions tagged gparted partitions merge or ask your own question. How to merge partitions without losing data? How do I move unallocated, non-adjacent space to another partition?